SPACIOUS THREE BEDROOM TERRACE BEING SOLD WITH NO VENDOR CHAIN!! HOME ESTATE AGENTS are delighted to bring to the market this spacious three bedroom mid-terrace house with the added bonus of a loft room. In brief the property comprises of an entrance hall, lounge, kitchen, conservatory, three bedrooms, family bathroom, loft room. The property is double glazed and is warmed by gas central heating. To the front of the property there is a driveway providing off road parking. To the rear of the property there is a paved patio area with a lawn garden. The property is situated near two popular primary schools and a high school, a short walk away from great transport links including Humphrey park train station. 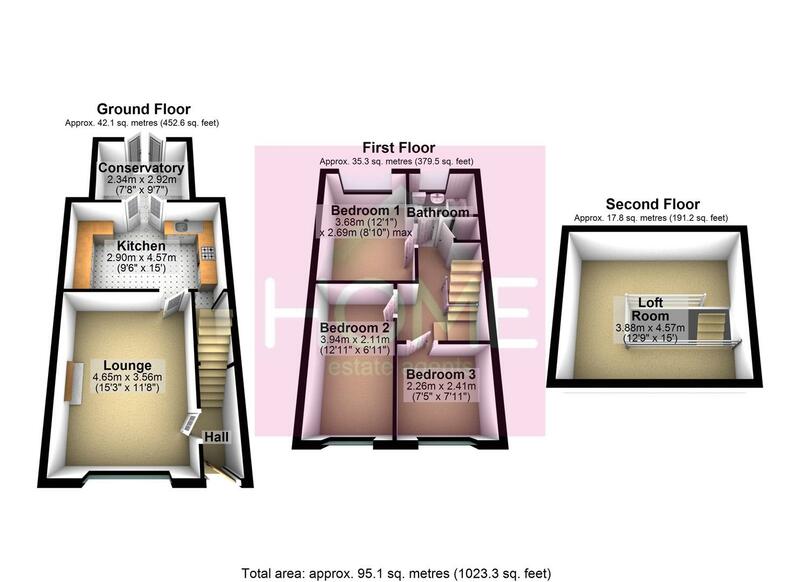 To arrange a viewing on this property call HOME on 0161 871 3939. Double glazed front door leading in, stairs leading to first floor. Range of wall and base units, with sink and drainage board incorporated, tiled to compliment, single built in oven, four burner built in gas hob, stainless steel cooker hood extractor, space for washing machine, single panel radiator. Double glazed windows, double glazed door leading to garden. Shaped lading with access to the loft room. Double glazed window to rear, built in wardrobe and draws, single panel radiator. Double glazed window to the front, single panel radiator. Double glazed window to front, laminate flooring, single panel radiator. Double glazed window to rear, bath with shower above and shower screen, low level W/C, pedestal sink, extractor fan, chrome towel radiator. Velux windows in ceiling, built in wardrobes and storage. To the front of the property there is a driveway providing off road parking. To the rear of the property there is a paved patio area with a lawn garden beyond and a path leading to a second patio.